One of the world’s rarest, and oldest, cheeses in the world is made in Lebanon through a traditional, though complicated, process that may be dying out. As the BBC reports, the cheese, called Ambarees, is around 2,000 years old. Ambarees is made in clay jars. The cheese is now made mostly in the small Lebanese town of Baalbek, in the summer and early fall months. Those practitioners that still make the cheese in the traditional way – and there are few of them remaining – fill the clay jar with milk, and then cover the top of the jar with a cloth. When the water separates from the milk, plugs at the bottom of the jar are released, letting the water drain out. Then, from May to October, salt and more milk are added to the curd twice a week as it dries. The cheese stays fresh for up to a year using this method, making it one of the oldest ways to preserve food in the world. Ambarees, also known as Sirdeleh or Labnet al Jarra, is a traditional dairy product of the Bekaa Valley and the Mountains of Lebanon where baladi (local) and shami (Syrian) goats are the main grazing animals. Ambarees consists of fermented raw goat milk in earthenware jars; It develops into a Labneh with a creamy texture and an acidic flavor. The word “Sirdeleh” actually refers to the earthenware jar in which the dairy product is prepared. The food that is produced in Baalbek, including Ambarees, and olives, eggplant, and yogurt, are produced and then stored for eating during the winter. The Lebanese woman in Baalbek who still makes Ambarees, whom the BBC spoke with, says that it is becoming increasingly difficult to find the traditional clay pot used for cheese production in homes anymore. She explains that the jars are usually passed down through families who have taken care of them through generations. Ambarees is a traditional wintertime snack in Lebanon, where people spread it on flat bread, which is grilled on wood-fire stove, and then eat it like sandwich. The cheese – though it’s not the homemade version that comes from the clay pot – can now be found more commonly in markets in Beirut, where one vendor said that most people don’t have time to make it through the traditional method anymore. Sadly, if people don't start finding the time, the ancient custom that created this cheese may disappear forever. by Florence Massena, Contributor, Lebanon Pulse - Having become familiar with some of the material, Gino Raidy, the vice president of MARCH, the nongovernmental organization (NGO) behind the museum, told Al-Monitor, “Different trends could be observed according to the decades. In the 1940s, it mostly involved mentioning Israel.” Raidy further asserted, “In the 1950s-1960s, sexual explicitness was tolerated, but not political discussions. In the early 2000s, there was strong opposition to heavy metal. People would be arrested in the streets for wearing a heavy metal band T-shirt as many thought it was satanic. What stood to be censored became clearer after the Syrian army left in 2005, mostly focusing on sectarian and politics-related material. Nowadays, we note that LGBT art and events are getting targeted more and more.” The virtual museum aims to identify not only what has been banned and censored, but also the reasons behind it, in an effort to present the big picture when it comes to limits on freedom of expression in Lebanon. The database launched on May 24, with an event at Phoenicia University, in Mazraat al-Daoudiyeh, in the south. An exhibition of panels and blackboards with words and names of individuals redacted to symbolize information omitted through censorship was followed by a discussion among free speech experts and activists. Participants included lawyer Hussein el-Achi, photojournalist Hussein Baydoun, author and activist Joumana Haddad, journalist and activist Luna Safwan and graffiti artist Omar Kabbani. In 2013 in Beirut, MARCH had organized “Censorship in Lebanon, An Uncensored Look,” a panel discussion on freedom of expression. Looking ahead, the team hopes to organize others in Tripoli after the end of Ramadan and maybe in the Bekaa Valley. 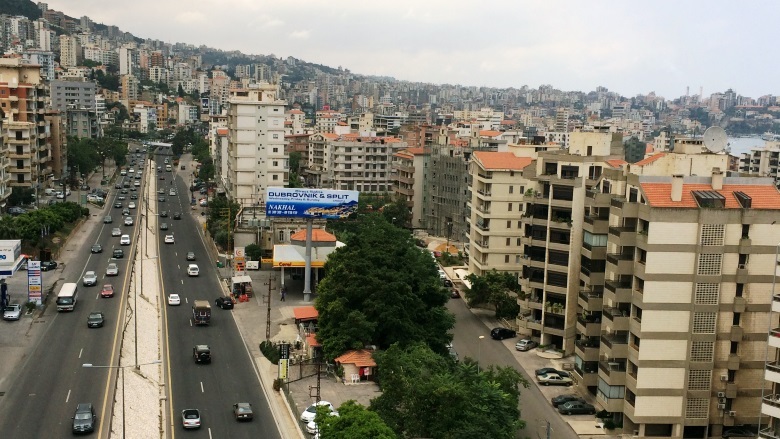 “We believe that getting out of Beirut is important not only to inform people about censorship but also to have more discussions, address a different crowd living in rural areas and see what they think about the issue,” said Raidy, who is also a blogger. “Virtually, anyone can see what cultural material has been banned and censored, as well as what journalists and activists have been through when it comes to the expression of certain issues. We also invite people to submit entries if they hear about something new. Control over every cultural product in Lebanon is based on a law or decree, as detailed in “Censorship in Lebanon: Law and Practice,” a 2010 study by Nizar Saghieh, Rana Saghieh and Nayla Geagea, who are lawyers and members of The Legal Agenda, an NGO that follows socio-legal developments in Lebanon and the broader Middle East. “Censorship of films in Lebanon is based on four very vague principles: respect for public morals, respect for the reputation or status of state authorities, respect for the sensitivities of the public and avoiding sectarian or religious incitement, and resisting calls that are unfavorable to the interests of Lebanon,” Ghida Frangieh, a lawyer with The Legal Agenda, told Al-Monitor. “If the General Security, which is a security agency, wants to ban a movie, it must refer it to an administrative committee, which reviews the film and gives its recommendation to the Ministry of Interior, which will make the final decision. The procedure is not transparent, and most of the time, the reason why a film is censored or banned is not given.” To this, Raidy added, “From the data we collected, the two main organizations asking General Security for censorship are first the Catholic Information Center and then Dar al-Fatwa,” the leading Sunni religious institution in the country. For example, in Nadine Labaki’s movie “Where Do We Go Now” (2012), a scene with a priest and a sheikh speaking to the public through the local mosque’s loudspeaker was cut. More recently, a Druze cleric's apparition was masked by a black dot in Philippe Aractingi’s 2017 movie “Listen /Ismaii.” Both decisions were supposedly based on concerns of sectarian incitement. New York times By Anne Barnard reported from Beirut, Lebanon, and David D. Kirkpatrick from London. Gardiner Harris and Michael R. Gordon contributed reporting from Sydney, Australia, and Rick Gladstone from New York. BEIRUT, Lebanon — Egypt, Saudi Arabia and three other Arab countries severed all ties with Qatar early Monday, in a renewal of a four-year effort to isolate it and in a sign of a new boldness after a visit to the region by President Trump. In an abrupt and surprising move, the five Arab states not only suspended diplomatic relations, as they have in the past, but also cut off land, air and sea travel to and from Qatar. All but Egypt, which has hundreds of thousands of people working there, ordered their citizens to leave the country. Qatar, like other monarchies in the Persian Gulf, is a close ally of Washington, and it hosts a major American military base that commands the United States-led air campaign against the Islamic State. As such, the feud among regional allies threatens to stress the operations of the American-led coalition and complicate efforts in the region to confront Iran — but could also be a heavy blow to Tehran’s regional ambitions, if Qatar is forced to sever ties. Continue reading the main story Related Coverage Secretary of State Rex W. Tillerson offered to broker the impasse on Monday in the hope of preserving the Trump administration’s efforts to create broad coalitions against Iran and terrorist groups in the Middle East. “We certainly would encourage the parties to sit down together and address these differences,” Mr. Tillerson said. The severing of all connections by Bahrain, Egypt, Saudi Arabia, the United Arab Emirates and Yemen created an immediate crisis for Qatar. Qatari diplomats were given 48 hours to leave their posts in Bahrain, while Qatari citizens were allotted two weeks to depart Bahrain, Saudi Arabia and the United Arab Emirates. 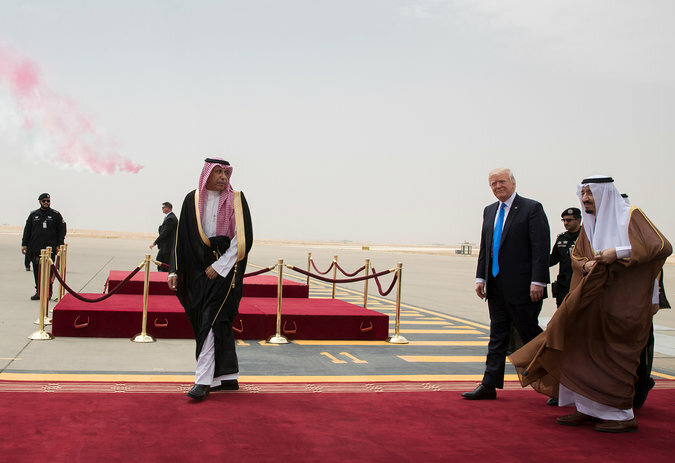 Photo President Trump in Riyadh, Saudi Arabia, in May. Mr. Trump’s strong support for the Saudis may have helped encourage other Sunni states to renew their campaign against Qatar. Credit Stephen Crowley/The New York Times Qatar, a relatively small country jutting into the Persian Gulf, has a border with Saudi Arabia and is vulnerable to its larger neighbor. It imports almost all of its food, about 40 percent of it directly from Saudi Arabia. Several residents, reached on the internet chat, said that people were stocking up on food and cash. . Air traffic was disrupted, with the United Arab Emirates suspending service to Qatar by its three carriers, Etihad Airways, Emirates and FlyDubai, beginning Tuesday morning. Qatar Airways was banned from Saudi airspace. Saudi Arabia said it was taking the action to “protect its national security from the dangers of terrorism and extremism.” The Foreign Ministry of Qatar released a statement saying the action had “no basis in fact” and was “unjustified.” The Iranian government criticized the Saudi-led action against Qatar in a diplomatically worded rebuke. “Neighbors are permanent; geography can’t be changed,” Foreign Minister Mohammad Javad Zarif said on his Twitter account. “Coercion is never the solution,” Mr. Zarif said. “Dialogue is imperative, especially during blessed Ramadan.” It was not immediately clear why the five countries decided to take this action now. Reported by Yassmine Alieh -businessnews.com.lb - Cityblu, a joint venture between local Société Mouawad Edde and Bulgarian firm Soriko, has begun garbage collection and transport in the cazas of Aley and Baabda. According to its contract with the Council for Development and Reconstruction (CDR), the company is also in charge of the Shouf area. Milad Mouawad, General Manager of Cityblu, said: “For now, the Shouf municipalities have not requested our help. We are responsible for the caza whenever they ask us to start operations there.” CityBlu will operate in four Aley towns only: Shoueifat, Bchamoun, Aramoun, and Deir Koubil. In the remaining towns and villages in Aley, the same conditions as Shouf will apply. The company has yet to begin road sweeping operations. Mouawad said: “We are waiting for the green light from the CDR.” According to him, the company plans to start road sweeping as a good will initiative for a limited time period until the CDR approval comes in. 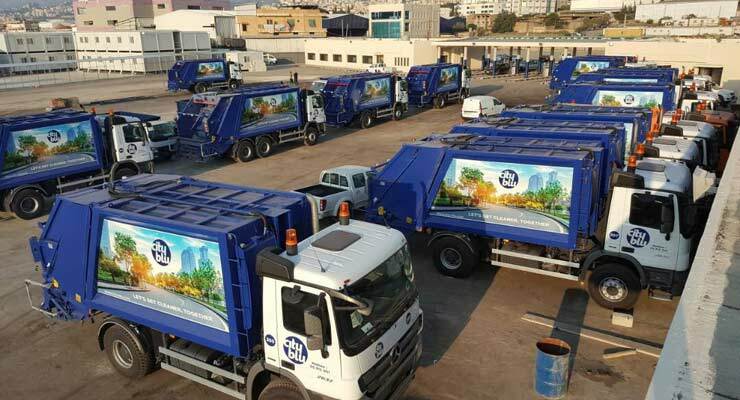 A week ago, the joint venture between local firm Ramco Trading and Contracting and Turkish firm Altas Temizlik, began collection and the pickup of waste in Metn and Kesrouan. It won the tender held by the CDR for $86 million over a period of seven years. The company operates in 120 towns in the two cazas and processes 1,200 tons of waste per day. The two companies took over operations from Sukleen, a company under Averda, which was in charge of road sweeping, the pickup and transport of garbage in Beirut and Mount Lebanon for the past 15 years. Asharq Al-Awsat Beirut – Lebanon’s Prime Minister Saad al-Hariri promised on Sunday to hold a cabinet session in Tripoli to endorse the city’s much-needed development projects. Speaking during a “Ramadan Suhour” held in his honor by former Minister Mohammad Safadi in Batroun, Hariri said: “Today, a new atmosphere prevails in the country that is in the interest of Lebanon as a whole, and Tripoli in particular.” Addressing ministers, deputies and prominent dignitaries representing the North region, Hariri said: “God willing, we will meet again in Tripoli. We are seeking to fulfill the interests of Lebanon and Tripoli, which really need a lot of work.” Thanking Safadi for his kind hospitality, the prime minister highly valued their “deep and honest friendship”. Safadi, for his part, lauded the Lebanese premier’s determination to tackle the needs of Tripoli and its surrounding region. In remarks last month, Hariri underlined the need to develop solutions, projects, and programs to address problems facing the northern city of Tripoli. “Tripoli, which was oppressed in recent years due to deliberate rounds of fighting and tensions, and to the distortion of its open, educated and moderate image, has a historic opportunity and we will not allow anyone to spoil it,” Hariri said during the opening of the “Tripoli Development Conference”, which was organized by the Safadi Foundation at the Grand Serail in May. AFP - BEIRUT: Daesh has claimed responsibility for the London attacks, which left seven people dead, an online news agency affiliated with the terrorist group said Monday. A “detachment of fighters from Islamic State (Daesh) carried out London attacks yesterday” the Aamaq news agency said, referring to Saturday’s assault which saw three men in a van plow into pedestrians on London Bridge before going on a stabbing spree. Daesh has also urged supporters to weaponize vehicles in attacks against the West. It was the third attack in Britain this year that Daesh has claimed — after a similar attack on Westminister Bridge in March and the Manchester concert bombing two weeks ago — and one of several involving vehicles in Europe, including last year's Bastille Day rampage in the French city of Nice. The three attackers Saturday were wearing what appeared to be suicide belts, but the belts turned out to be fake. Investigators were working to determine whether others assisted them, Rowley said. A bystander was also wounded by the gunfire, but the civilian's injuries were not believed to be critical. Forty-eight people, including two police officers, were treated at hospitals. Twenty-one remained in critical condition Sunday. Among the wounded were German, French and Spanish citizens, officials said. Canadian Prime Minister Justin Trudeau said a Canadian was among the dead. A French national was also confirmed dead. Counterterrorism officers raided several addresses in Barking, an east London suburb, and arrested 12 people there Sunday, police said. Neighbors at the site of one raid in Barking said a man who lived there resembled one of the attackers shown in news photographs. Armed officers also conducted a raid in the East Ham area of the city. Video showed police shouting at someone: "Get on the balcony. Stand up and show us your hands!" The rampage was the third major attack in Britain in the past three months, including a similar vehicle and knife attack on Westminster Bridge in March that left five people dead. On May 22, a suicide bomber killed 22 people and injured dozens at an Ariana Grande concert in Manchester, in northwest England. Grande and other stars performed Sunday night at a benefit concert for victims under tight security in Manchester. The Daesh group claimed responsibility for the Manchester bombing, but there was no immediate claim of responsibility for the London attack. FFA Private Bank, one of the leading investment companies in Lebanon, is all set to launch a structured investment vehicle to channel the country's investments in power sector and infrastructure projects. A first-of-its-kind in the country, Lebanon Infrastructure Fund is very advanced in terms of financial sophistication, said its top official. The initial objective is to reach $1 billion of investments in the short-to-medium term, over two to three years, remarked FFA Chairman Jean Riachi. It will be mainly focusing on solar, wind, and hydraulic power projects besides waste-to-energy projects and waste treatment projects, he noted. According to him, the financing could take different shapes whether debt or equity financing. It could include bonds, bank loans and vendor financing, Riachi told The Daily Star. The funding could also be in the form of multilateral financing obtained from international organizations such as the International Finance Corporation, German state-owned development bank KfW and French development-financing institution Proparco, he added. Iyad Boustany, managing director and head of corporate and investment banking at FFA, said the bank's job is to provide the structure or the sponsor. FFA is eyeing various infrastructure projects with special attention to renewable energy, he noted. Lebanon, he stated, has a reasonable wind potential, especially in the district of Akkar in north Lebanon. There are currently three projects under final review on the table of the cabinet, each with an average capacity of 70 MW. All three projects of $100-150 million each are located in the same area and are likely to represent 100 per cent of the wind-farm sector in Lebanon, he added.